The fact that at an early date the word casal established itself in the Celtic language, and that St. Patrick's casal in particular became famous, makes the allusion of the "house head-holed" almost certain. We can hardly help being reminded of St. Isidore's definition of casula as "a garment furnished with a hood, which is a diminutive of casa, a cottage, as, like a small cottage or hut, it covers the entire person". In the earliest chronicles some modification seems to have already taken place in the primitive conception of a hole cut in round piece of cloth. The early medieval chasubles were made of a semicircular piece of stuff, the straight edge folded in the middle, and the two borders sewn together, leaving an aperture for the head. From this it will be seen that the chasuble is only a cope of which the front edges have been sewn together. The inconvenience of the primitive chasuble will be readily appreciated. It was impossible to use arms or hands without lifting the whole of the front part of the vestment. To remedy this, more than one expedient was resorted to. The sides were gradually cut away while the length before and behind remained unaltered. Thus, after being first curtailed at the sides until it reached but little below the elbows, it was eventually, in the sixteenth century, pared away still farther, until it now hardly extends below the shoulders and leaves the arms entirely free. While this shortening was still in progress, it became the duty of the deacon and subdeacon, assisting the celebrant, to roll back the chasuble and relieve as far as possible the weight on his arms. Directions to this effect are still given in the "Cæremoniale Episcoporum", where it speaks of the vesting of a bishop (Cæremon. Episc., lib. II, cap. viii, n. 19). Another device adopted in some medieval chasubles, to remedy the inconvenience caused by the drag of the vestment upon the arms, was to insert a cord passing through rings by which the sides of the chasuble could be drawn up to the shoulders and secured in that position. This, however, was rare. 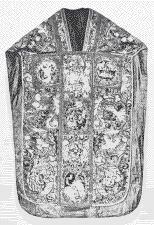 The chasuble, though now regarded as the priestly vestment par excellence, was in the early centuries worn by all ranks of the clergy. 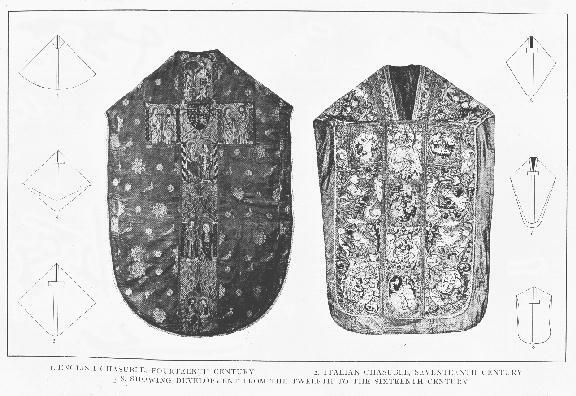 "Folded chasubles" (planetæ plicatæ), instead of dalmatics, are still prescribed for the deacon and subdeacon at high Mass during penitential seasons. The precise origin of this pinning up of the chasuble is still obscure, but, like the deacon's wearing of the broad stole (stolone)--which represents the chasuble rolled up and hung over his shoulder like a soldier's great-coat--during the active part of his functions in the Mass, it probably had something to do with the inconvenience caused by the medieval chasuble in impeding the free use of the arms. Of the chasuble as now in common usage in the Western Church two principal types appear, which may for convenience be called the Roman and the French. The Roman is about 46 inches deep at the back and 30 inches wide. It is ornamented with orphreys forming a pillar behind and a tall cross in front, while the aperture for the neck is long and tapers downwards. The French type, also common in Germany and in a more debased form in Spain, is less ample and often artificially stiffened. It has a cross on the back and a pillar in front. In medieval chasubles these orphrey crosses often assume a Y form, and the crosses themselves seem really to have originated less from any symbolical purpose than from sartorial reasons connected with the cut and adjustment. Like the other sacred vestments the chasuble, before use, requires to be blessed by a priest who has faculties for that purpose. When assumed in vesting for Mass, the act is accompanied with a prayer which speaks of the chasuble as the "yoke of Christ". But another symbolism is indicated by the form attached to the bestowal of the chasuble in the ordination services: "Receive", says the bishop, "the priestly vestment, by which is signified charity." BRAUN, Die liturgische Gewandung (Freiburg, 1907), pp. 149-239; ROHAULT DE FLEURY, La Messe (Paris, 1886), VII; BOCK, Geschichte der liturgischen Gewänder (Bonn, 1856-71), II-III; THALHOFER, Liturgik (Freiburg, 1883), I; DE VERT, Explication des cérémonies de l'église (Paris, 1706-8); ROCK, Church of Our Fathers (London, 1903), II; BARBIER DE MONTAULT, Les costumes et les usages ecclésiastiques (Paris, 1901), II; VAN DER STAPPEN, Sacra Liturgia (Mechlin, 1902), IV, 124-188; THURSTON, in THE MONTH (Dec., 1898) and in The Tablet (Dec. 28, 1907); HEFELE, Beiträge (Tübingen, 1864), II, 150-223. MLA citation. Thurston, Herbert. "Chasuble." The Catholic Encyclopedia. Vol. 3. New York: Robert Appleton Company, 1908. <http://www.newadvent.org/cathen/03639a.htm>. Transcription. This article was transcribed for New Advent by Wm Stuart French, Jr. Dedicated to Sister Anna Maria, MICM and Sister Mary Theresa, MICM.